External Tank-119 (ET-119), set to fuel NASA's Discovery orbiter during STS-121 mission later this year, is prepared to be shipped to Kennedy Space Center from Michoud Assembly Facility in New Orleans. 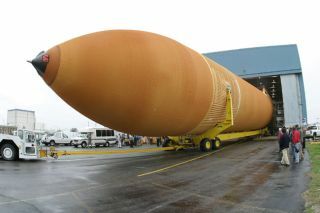 CAPE CANAVERAL - Kennedy Space Center is preparing to receive a shuttle fuel tank and get it ready for a Maylaunch. The tank is expected to ship out of New Orleans this morning. Officials originally saidthe tank would ship Friday from the Michoud Assembly Facility, but work wasdone on the tank Thursday night, and the insulating foam had to cure forseveral hours. Friday, the tank wasrolling out of its processing facility to be loaded on the barge. It shouldarrive at Kennedy Space Center on Wednesday or Thursday. This tank is shipping withoutsome stretches of foam that flew on earlier tanks. That foam was used toprotect cables running up the tank. The foam on this tank wasremoved as a safety precaution after a piece of it felloff during Discovery's launch last summer, raising fears of a Columbia-typeaccident. Managers plan wind tunneltests and more analysis to prove the modification is safe before final approvalfor a May launch can be given. "We're not going to doanything that will prevent any additional work in that area," NASAspokesman Bruce Buckingham said at Kennedy Space Center. "It's possiblethe tank will be ready to fly as-is, depending on what the program decides." Publishedunder license from FLORIDA TODAY. Copyright ? 2006 FLORIDA TODAY.No portion of this material may be reproduced in any way without the writtenconsent of FLORIDA TODAY.